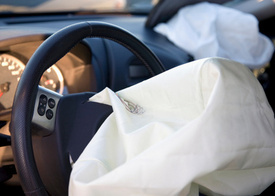 Plainfield, NY — A two-vehicle crash killed a 22-year-old Mohawk woman Saturday afternoon, May 29, 2012. The fatal automobile accident occurred on Route 18 in the Town of Plainfield around 12:30 p.m., reported WKTV.com. According to State Police investigators, 22-year-old Nicole Dukerich was headed north on Route 18 when she failed to stop at a stop sign, causing her to collide with a vehicle driven by 36-year-old Heather Simmons of Canastota. Responding emergency crews pronounced Dukerich dead at the scene of the accident. Dukerich’s 3-year-old son, who was also in the vehicle, suffered serious injuries. He was rushed to Upstate Medical Center in Syracuse where he is in critical condition. Simmons’ 12-year-old daughter and her daughter’s 13-year-old friend were in her car. Simmons was airlifted to Saint Elizabeth Medical Center in Utica where she is listed in serious condition. The two minors were taken to area hospitals where they are both listed in critical condition. State Police are continuing to conduct investigations into the deadly two-vehicle crash.